It was a bit shocking the other day, to hear another missionary telling a church, “We don’t do handouts!” Shocking, but absolutely spot-on. Christ said, “The truth shall set you free.” Handouts, on the contrary, lead to dependency, not freedom. So we don’t do handouts. We empower people. We teach them how to use the gifts God gave them, to improve their lives and free them and their children. If we help them learn to read, they can then learn to be free from AIDS, or a fear of AIDS. When they build their own water collection system, and their own water filter, it frees them from disease and from trudging miles to a dirty pond for water. They can raise healthier animals and better gardens, and make a better life for their family.We empower them by working with them to use the resources they already have. If we gave them water filters, we might have a moment’s contact, from a benefactor to a supplicant. That’s not a good relationship for either person. The real need is not for filters or tanks, but for learning, and learning is a two-way street. When we work together to build a filter or a bottle-brick cistern, we all learn, we all have something to offer, and we all build relationships. When we have finished, the people who have built the filter or the tank or have learned to read can go back to their home and teach their neighbors to do the same. We have certain principles which we use as a measuring stick, a canon in the classical sense, for choosing the work we will do in the community. This is the first: Can local people do this with materials they have or can afford? Put another way, will they need something from elsewhere (America, for example) or money from elsewhere in order to do this again? The answer must be that they can do this with their own resources, or it is not a worthy offering to them. Each thing we do must free them from being dependent; must enable them to help themselves and their neighbors. What do empty soda bottles have to do with saving souls? We made a tremendous discovery while we were helping the church at Monduli Juu! By the way, Monduli is the general region. Juu means “upper.” We have rented a house in this community, about a quarter mile from this church. Our co-workers, Lewis and Tammy Short, live in Lower Monduli, or Monduli Chini. This church–and the community they are located in–has no water supply. They carry water in from streams and ponds a couple of miles away; the same streams and ponds that are used to water animals. It’s not clean water, but it’s all they have. We proposed collecting rain water from the church building, and sharing it with the community. Initially, we were going to buy large vinyl tanks. We told the church that we would partner with them: if they buy one tank, we will match it. But since they don’t have a lot of cash, that wasn’t working well. 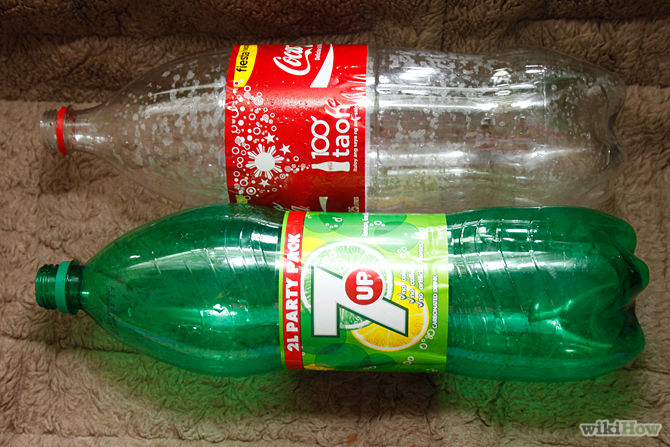 We found a design for building tanks and houses out of discarded soda bottles, filled with dirt. You still have to buy cement, but nearly all your other materials are free. We proposed this to the members of the Monduli Juu church. So after collecting about 500 bottles, we set a day and started building a tank. 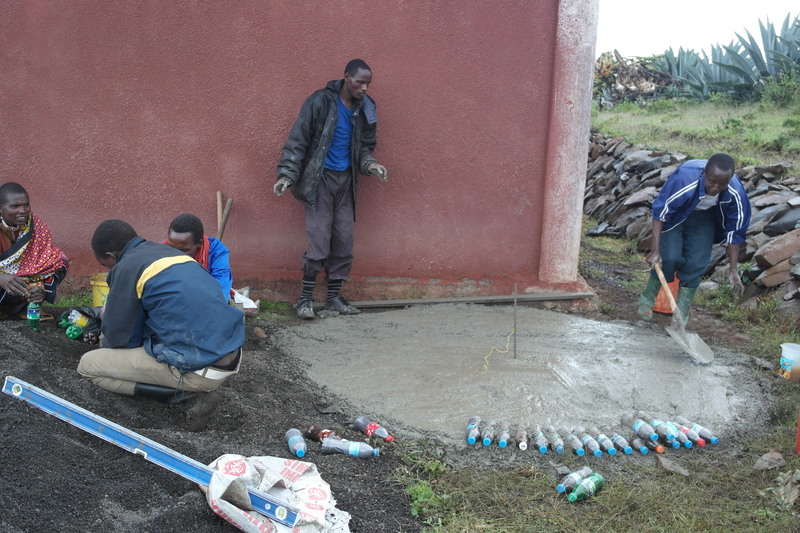 We drew a circle on the ground, and mixed concrete to pour a circular floor. While one group was preparing concrete, another group started filling plastic bottles with dirt. 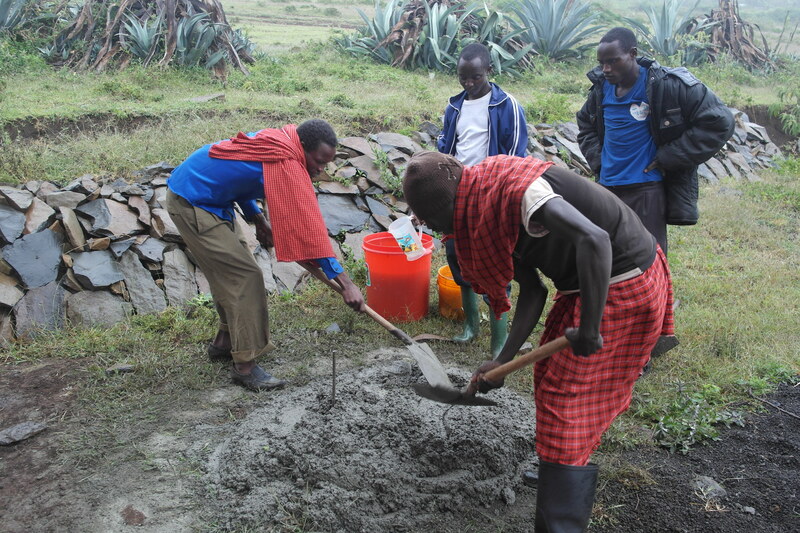 We mixed mortar, and started building a circular cistern. When one of the neighbors wanted to learn how to build this way, we all got together another weekend and worked together with her family. Mixing concrete on location. You can see the center stake and part of the inscribed circle. Filling bottles with dirt and ground pumice. In the background, the first few bottle bricks have already been laid. That’s when we made our discovery. 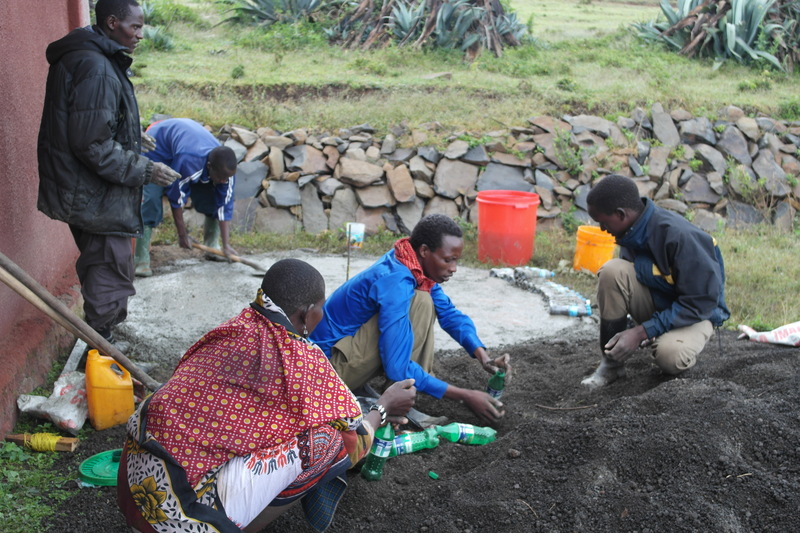 It took a long time to fill bottles and mix cement and lay bottle bricks, and all that time, people were chatting. They made fun of each other, and they exchanged phone numbers. They tried to figure out which friends they had in common. In short, this time-consuming, tedious process was a perfect opportunity for evangelism! It meets a felt need: for good water storage near home. It’s sustainable: anyone can do it with local materials (and it cleans up the environment!). And it provides a lot of relationship-building time between the local church and the non-believers who want to learn about this method. This was exactly the sort of project we had been looking for. This method can help us become a valued part of the community, and can be part of an indigenous evangelism effort. And that’s how we use empty soda bottles to win souls for Christ! We should sleep well tonight!